Two leading academics have developed a new food design technique to help inspire the next generation of culinary designers and make artistic food presentation more accessible to New Zealand restaurants. The new technique developed in consultation with EPIC Otago Polytechnic R & D centre and The Food Design Institute at Otago Polytechnic allows chefs to produce large quantities of artistically designed food products by hand on a commercial scale with a small team, and at reduced cost. Otago Polytechnic’s Timothy Lynch, who and lectures on sustainability in the food industry, says they wanted to present ingredients in a way that was consistent with multisensory food design concepts. “Initially we couldn’t find a way to make these products on a small scale, but a collaboration with the EPIC helped us overcome several barriers, and we were able to develop a method of crafting the lifelike products using food-grade silicon moulds, which we made ourselves,” he says. Lynch says a project of this scale and complexity would require international assistance and a large team of scientists and food specialists. This would have made the project cost prohibitive by New Zealand industry standards, he says. 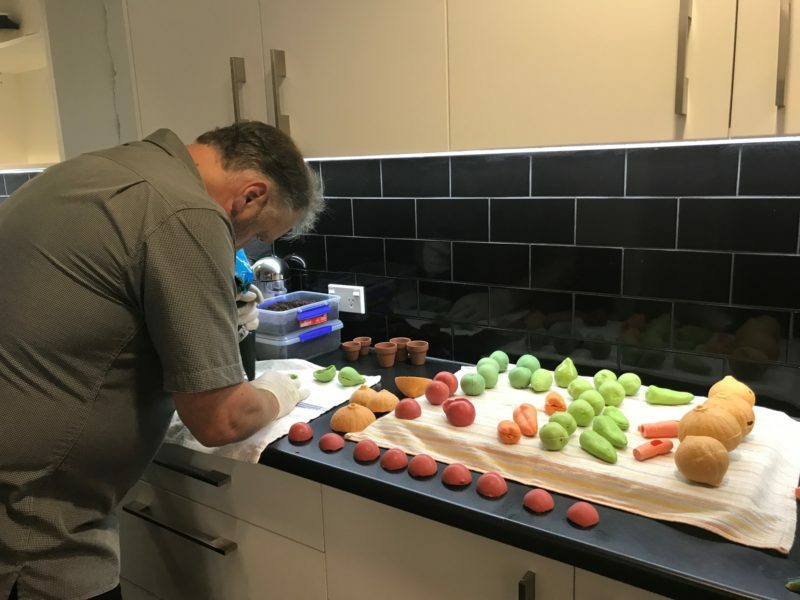 “Thanks to the ingenuity of some of our colleagues and the dedication of our staff and students we have managed to find a way to bring these food creations to life,”- says Lynch. Senior lecturer Tony Heptinstall who has catered for Prince Charles and other royal family members says one of the objectives was to increase current industry capital through being part of an innovative collaboration between the food industry and education. “We were conscious that to inspire the students we needed to take on a challenge that solved a real-world problem and used design thinking at the same time,” he says. “The technique involves making edible fruit and vegetables replicas from vegan white[HS1] chocolate and So Good milks –,” says Heptinstall. The hand moulded products are then filled with a variety of contrasting l recipe combinations using a diverse range of readily available ingredients including the nut milks. “What we’re doing is not only highlighting the design evolution of the food we are able to create, but also embrace the contemporary movement towards flexitarian and vegetarian diets,” says Heptinstall. “People are looking at food from not just a taste and health consideration but from a sustainability and environmental perspective,” he says. Sanitarium’s marketing business manager Hayley Scott who approached the tertiary institution with the technical challenge said the outcome surpassed their expectations. “We approached the polytechnic to help us come up with a way to show Kiwis how Non-Dairy milks can be used creatively in kitchens around the country. A proof of concept display has been created in the form of an entirely man made, edible garden where more than 3,000 hand-crafted fruit and vegetables will be made available to the public to sample.